This is one of the original meccas of travel. Back in the 1960s backpackers and hippies from the UK packed their smelly clothes and started exploring this beautiful region. They found the incredible mountains, smelly hookas and invigorating spice markets. It's still there and it's still one of the most amazing countries to travel. Visas are not required for British, Australian, New Zealand, Canadian, US and other EU nationals for a stay of up to 3 months. Please ensure your passport is valid for six months after your return date and that you get your passport stamped upon entry into Morocco. All other nationalities should contact the Moroccan embassy for details. Visas are your responsibility. Make sure you are sorted before you travel. We recommend that you check the latest visa requirements thoroughly before booking. It is recommended that you are vaccinated for Tetanus and Polio, if you have not had a booster in the last ten years. Food and waterborne diseases are more common, so we recommend vaccinations for typhoid (valid 3 years) and Hepatitis A (validity varies). Morocco is not a high risk malaria area but if in any doubt please consult a physician or travel clinic for further information. All our passengers must be fully insured for travel in Morocco. It is essential that you get the correct level of cover and it is advised that you speak to your travel insurance provider for advice. Please ensure that the policy provides adequate cover for hospital treatment, repatriation flights home in the event of you being too ill to continue the tour, personal accident, personal baggage and associated valuables. Please note that some optional activities may require additional cover. You must bring the policy with you as it is obligatory for joining any expedition. One main backpack or suitcase (either is suitable) of approx. 20kgs max per person is permitted Also bring a daypack, to keep personal items such as your wallet, camera and water bottle. Pack sensibly and take garments that are comfortable and cool. Morocco can be very hot in summer but at night the temperatures drop, so pack accordingly. MAD = Moroccan Dirham, rates are subject to fluctuation. Exchange facilities are available at various bureau de changes in major towns and most banks have ATMs. How much spending money is needed depends largely on the individual. We currently recommend an average of €20 - €30 per day. We cannot specify every cost however and you will need to allow for expenses such as drinks, snacks and the odd souvenir. Travellers Cheques can be difficult to change en route so we recommend you have cash for convenience and bring a card to use in ATMs. Most accept Visa, MasterCard, Electron, Cirrus and Maestro. There are ATMs in the main civic centres throughout Morocco. Temperatures in Morocco are generally high, particularly during the summer months from May to September, so take sunscreen. We cannot emphasise enough that we are travellers and therefore guests. It is our duty to respect and adjust where possible to the people of the region. Your Tour Leader will also brief you on environmental matters. Morocco is predominantly Muslim and as such, we would ask all of our customers to respect and adhere to (when appropriate) the dress codes of the Islamic faith. This entails covering of shoulders and knees. All our Morocco Trips are operated by our local partners Nomadic .Nomadic Expeditions are members of Survival which campaigns for the rights of tribes people through out the world. We also donate to the Ait Ouham Association for Development, a local organisation in the Atlas Mountains that seeks to improve lives through education. Stay under the stars in a traditional Berber camp, trek through the sultry Sahara, and spend time in a beautiful fishing village. Take this adventure and experience an escapade that’ll truly satisfy your wanderlust. This Morocco trip is an adventurer’s dream journey. Where the unique customs can change your perspective. 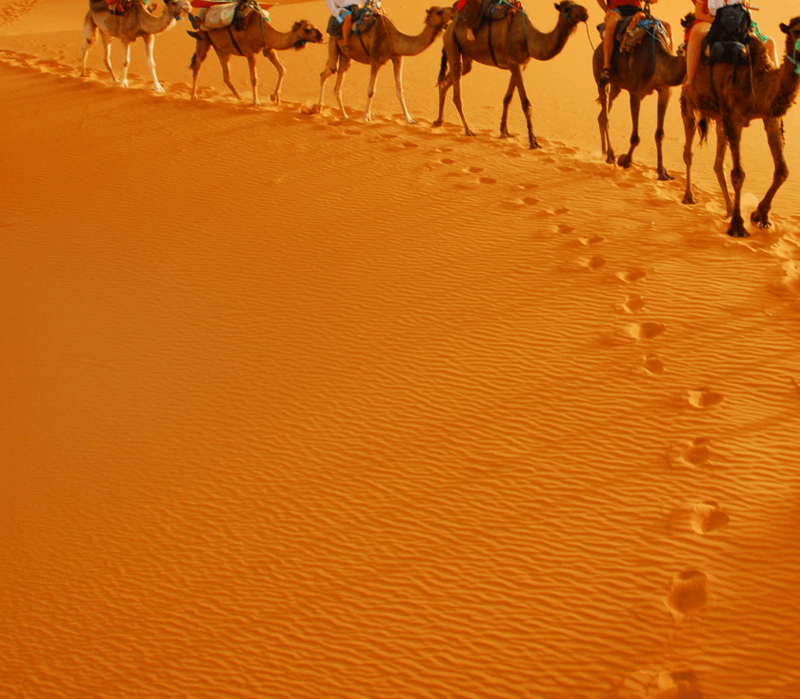 Get ready to experience new views, and venture into the culture of Morocco. Get lost for hours in intoxicating spice markets, stare up at the best stars you’ve ever seen in your life, and trek the Sahara!